Who knew our Founding Fathers could be this cool? Tony- and Pulitzer Prize-winning Lin-Manuel Miranda, that’s who. HAMILTON runs May 22-June 10 at the Fox Theatre. Details, tickets (which can top $600) HERE or at 855.285.8499. YOU MIGHT NOT have given him much thought until recently, but the guy on the $10 bill has become the most popular Founding Father in the land. His name is Hamilton, and here’s how it happened. 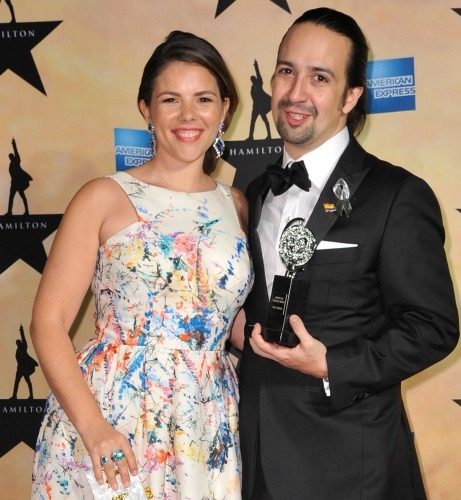 In the summer of 2007, just before his In the Heights moved to Broadway, playwright-composer Lin-Manuel Miranda was vacationing in Mexico with then-girlfriend Vanessa Nadal. He was reading Ron Chernow’s 818-page Alexander Hamilton. “That sounds cool,” she replied. Miranda and Nadal had known each other since high school, and he held great stock in her opinions, even though she’s not particularly fond of musicals. Her response was all the encouragement he needed. Miranda spent the next seven years writing the book, music and lyrics for Hamilton. Nadal came home from work one day and said, “Your king tune was stuck in my head all day — that’s probably a good sign.” She was right. King George’s witty Beatle-esque “You’ll Be Back” became a showstopper for Tony Award nominee Jonathan Groff. Miranda, now 38, considers Hamilton a love letter to his wife. “This show simply doesn’t exist without Vanessa,” he says. He calls her the “best of wives and best of women,” just as Hamilton does his wife, Eliza. Julia K. Harriman is Eliza Schuyler Hamilton. Harriman, 25, has worked mostly as a singer-songwriter and voice-over artist, with little theater experience. She often had trouble getting cast, she says, citing her Asian-Caucasian heritage. In Hamilton, that’s an advantage. From the get-go, Miranda envisioned a multicultural cast — to represent a nation born to welcome immigrants and to signal America’s diversity today. 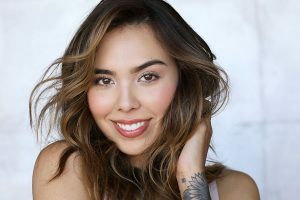 For her first 10 months in Hamilton, Harriman stood by for the three Schuyler sisters, which meant learning four key roles, a time she calls “terrifying and intense.” She only knew a song or two from the score when she auditioned and was cast before ever seeing it. Hamilton opened on Broadway on Aug. 6, 2015, and became an immediate box-office hit and critical favorite. Hamilton won the 2016 Pulitzer Prize for Drama and the Tony Award for best musical. 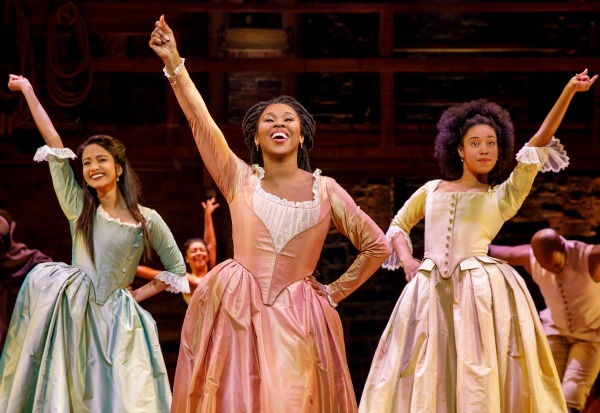 It won 11 of the 16 Tony categories in which it was nominated, including direction (Thomas Kail), leading actor (Leslie Odom Jr.’s Aaron Burr), featured actress (Renee Elise Goldsberry’s Angelica Schuyler), featured actor (Daveed Diggs’ Marquis de Lafayette and Thomas Jefferson), book and score (Miranda), choreography, orchestrations, costumes and lights. 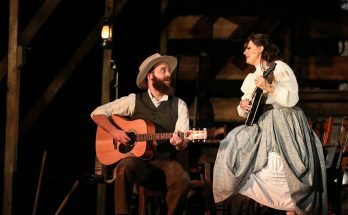 The one-of-a-kind musical shows no signs of slowing. 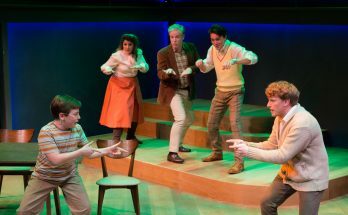 Four productions are playing simultaneously around the country, a feat never before accomplished. That means that more than 8,000 people experience Hamilton somewhere in North America each night, the Hollywood Reporter says. It’s also in London, and Miranda is planning to reprise his leading role and take Hamilton to Puerto Rico. 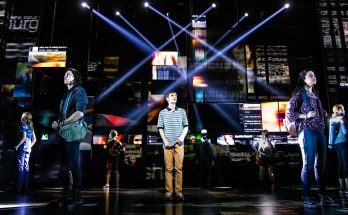 How to account for this watershed moment in theater history? The words “epic” and “contemporary” come to mind. The Schuyler sisters — Eliza, Angelica and Peggy — sneak into New York City to watch the men at work. 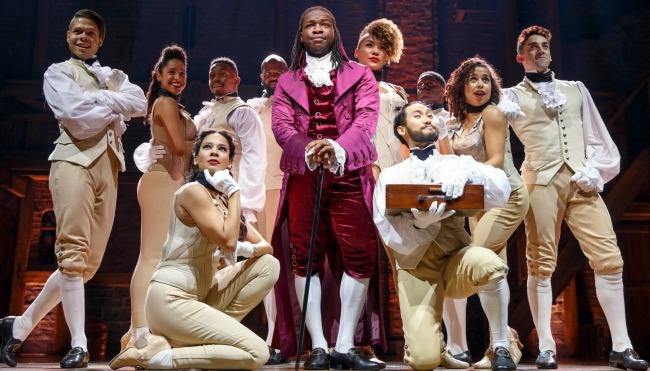 The show’s up-to-the-minute vibe, multiracial casting, earth-tone design, energetic choreography, layered lyrics and melodic score (incorporating rap, soul, R&B and traditional Broadway sounds) have won over throngs who claim to have never liked musicals before. Harriman says she enjoys meeting and chatting with kids who see Hamilton as part of the show’s educational outreach. Chris De’Sean Lee (from left), Jeffrey Duffy, Jennifer Geller, Hope Endrenyi. CHRIS De’SEAN LEE (Marquis de Lafayette/Thomas Jefferson) was born in Augusta and raised in Atlanta. He recently completed his junior year at Belmont University in Nashville. JENNIFER GELLER (Ensemble) grew up in Marietta and attended Pebblebrook High’s CCCEPA. She has performed in regional theater and toured with Bring It On: The Musical. HOPE ENDRENYI (Swing) grew up and trained in Marietta. She, too, attended Pebblebrook High’s CCCEPA. She has a B.F.A. in dance from Southern Methodist University in Dallas.